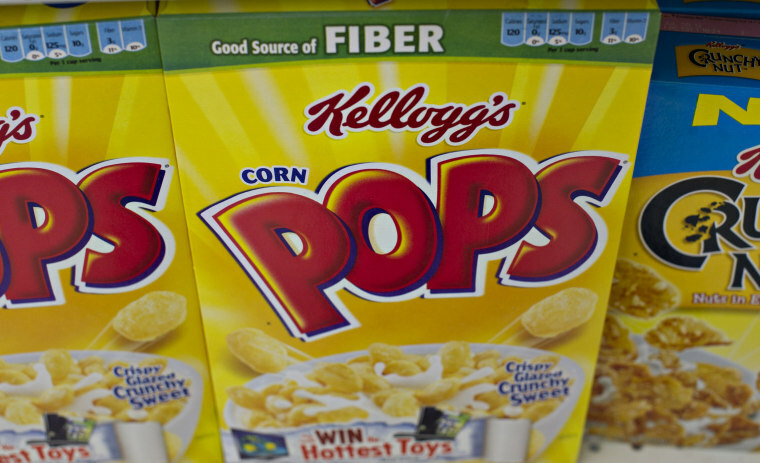 Kellogg's has agreed to redesign the artwork on its Corn Pops cereal boxes after a complaint on Twitter slammed it as racially insensitive imagery. The cereal box's artwork shows the corn pop cartoon characters inhabiting a shopping mall and taking part in various activities. Some corn pops are shopping, while others are playing arcade games or jump rope. Amid the bustle is one brown-colored corn pop dressed as a janitor pushing a floor waxer. Writer Saladin Ahmed used Twitter on Tuesday to express dismay that the only brown-colored corn pop was a janitor and said the illustration was teaching racism. Some Twitter users pointed out that corn pops aren't actually alive and don't have jobs. But Ahmed, a writer for Marvel Comics' "Black Bolt" series, added in a follow-up tweet that while his complaint might seem like a "tiny thing," it is an issue when "you see your kid staring at this over breakfast and realize millions of other kids are doing the same." In a response five hours later, Kellogg's tweeted an apology and confirmed the artwork was being updated in new packaging. Ahmed expressed appreciation for the company's quick response in another post. Kellogg's, America's largest cerealmaker, didn't immediately respond to a request for comment Thursday. Social media backlash surrounding issues such as airlines mistreating passengers has prompted a sense of immediacy among companies, said Isra Ali, a clinical assistant professor in media, culture and communication at New York University. "I think that you are seeing companies recognize the power of social media," Ali said. "Companies that are responsive position themselves better for consumers, and it is important to be socially engaged and sensitive to issues concerning marginalized groups." Prior to the incident with Kellogg's, other companies have received negative feedback regarding failed marketing attempts. Earlier this month, Dove received pushback on social media for what some people considered a "racist" advertisement and released an apology on Twitter. The commercial featured a black woman removing a T-shirt, and underneath was a white woman who then removed her T-shirt to reveal an Asian woman. The clip showing only the black and white women went viral on social media and sparked a boycott with the hashtag #boycottdove.